You should appraise the reasons and take corrective steps to rectify any delays in receiving and depositing cash. What to do: Ascertain how and where cash receipts come, how cash is transferred from outlying accounts to the main corporate account, banking policy on fund availability, and time lag between receiving a check and depositing it. Mail float. The time it takes for a check to move from customer to the company. Processing float. The time it takes for the company to record the payment in the books. Deposit collection float. The time for a check to clear. You should evaluate the causes and take corrective measures for delays in having cash receipts deposited. One should ascertain how and where the cash receipts come, how cash is transferred to your bank account, banking policy regarding availability of funds, and time lag between receiving a check and depositing it. What Does The Amount Of Float Depend On? The amount of float depends on both the time lag and the dollars involved. Float may be determined in dollar-days multiplying the lag in days by the dollar amount delayed. The cost of float is the interest lost because the money was not available for investment or the interest paid because money had to be borrowed during the lag period. 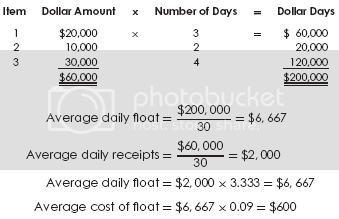 The cost of float is computed by multiplying the average daily float by the cost of capital (opportunity cost) for the time period involved. How can cash be received sooner?
. Lockbox arrangement where the collection points are situated closer to customers. Customer payments are mailed to strategic post office boxes to speed mailing and depositing time. Banks collect from these boxes several times a day and make deposits to the corporate account. Furthermore, one should arrange for weekend deposits into the lockbox. There is a computer listing of payments received by account and a daily total. Recommendation: Undertake a cost-benefit analysis to assure that the lockbox arrangement results in net savings. Determine the average face value of checks received, cost of operations eliminated, reducible processing overhead, and reduction in ‘‘mail float’’ days. Because per-item processing cost is usually significant, it is beneficial to use a lockbox with low-volume, high-dollar collections. However, lockboxes are becoming available to companies with high-volume, low-dollar receipts as technological advances (such as machine-readable documents) lower the per-item cost. Tip: Compare the return earned on freed cash to the cost of the lockbox. A wholesale lockbox is used for checks received from other companies. The average cash receipts is large, and the number of cash receipts is small. The bank prepares an electronic list of payments received and transmits the information to the company. A wholesale lockbox strengthens internal control because there is a separation between billing and receivables processing. Many wholesale lockboxes result in mail time reductions of no more than one business day and check-clearing time reductions of only a few tenths of one day. Wholesale lockboxes are cost-effective for companies having gross revenues of at least several million dollars. They work best when large checks are received from distant customers. A retail lockbox is used for a company dealing with the public (retail consumers as distinguished from companies). Retail lockboxes usually have numerous transactions of a nominal amount. The lockbox reduces float and transfers workload from the company to the bank. The bottom line should be more cash flow and less expenses.
. Identify and monitor changes in collection patterns. The reasons for delays should be ascertained, and the underlying problems should be corrected.
. On the return envelope for customer remission, use bar codes, nine-digit code numbers, and post office box numbers. Note: Accelerated Reply Mail (ARM) is the assignment of a unique ‘‘truncating’’ ZIP code to payments, such as lockbox receivables. The coded remittances are removed from the postal system and processed by banks or third parties.
. Send customers preaddressed, stamped envelopes. Include an ‘‘Attention’’ line on the return envelope to speed delivery within the company. Return envelopes reduce customers’ errors in addressing and accelerating mail handling.
. Obtain permission from a customer to have a preauthorized debit (PAD) charged to the customer’s bank account automatically for recurring charges. An example is an insurance company that has PADs charged to its policyholders for insurance premiums. These debits take the form of paper preauthorized checks (PACs), or paperless automatic clearing house entries. PADs result in cost savings because they avoid the process of billing a customer, receiving and processing a payment, and depositing a check. Note: Variable payments are not as efficient as fixed payments because the amount of the PAD must be changed each period, and usually the customer must be notified by mail of the amount of the debit. PADs are suggested for constant, relatively nominal periodic (e.g., monthly, semiweekly) payments.
. Transfer funds between banks by wire transfers or depository transfer checks (DTCs). Wire transfers can be used for intra-company transactions. Wire transfers can be made by computer terminal and telephone. A wire transfer allows for the same-day transfer of funds. It should only be made for significant dollar amounts since per-wire transfer fees are charged by both the originating bank and the receiving bank. Examples include making transfers to and from investments, placing funds in an account the day checks are expected to clear, and placing funds in any other account that requires immediate fund availability. Two types of wire transfers are preformatted (recurring) and free-form (non-repetitive). In the case of preformatted wire transfers, extensive authorization is not required. This type is appropriate for usual transfers such as for investments and other company accounts. The company specifies an issuing bank and a receiving bank along with the account number. There is greater control for nonrecurring transfers. The control includes written confirmation rather than confirmation from telephone or computer terminal. Wire transfers may also be used to fund other types of checking accounts, such as payroll accounts. In order to control balances in the account, the account may be funded on a staggered basis. However, to guard against an overdraft, balances should be maintained in another account at the bank. Paper or paperless depository transfer checks can be used to transfer funds between the company’s bank accounts. Although no signature is required on depository transfer checks, the check is still payable to the bank for credit to the company’s account. However, controls must be in place so an employee does not use depository transfer checks to transfer money from an account on which he or she does not have signature authorization to an account in which he or she does. Depository transfer checks usually clear in one day. If manual depository transfer checks are used, preprinted checks include all information except the amount and date. Manual preparation is suggested if there are only a few checks prepared daily. If there are automated depository transfer checks, they are printed as needed. Tip: It is typically cheaper to use the bank’s printer than for the company to buy its own. Automatic check preparation is suggested when many transfer checks are prepared daily.
. Encourage customers to use a purchase order with payment voucher attached (POPVA). The payment voucher is a blank draft that the seller fills out, detaches, and then deposits. It is usually for amounts less than $1,000. Buyers will only deal with sellers they trust to make this arrangement.
. Accelerate billing. Send out bills to customers immediately when the order is shipped. Also, send out individual invoices rather than only a monthly statement.
. Require deposits on large or custom orders or progress billings as the work progresses.
. Promptly correct invoice errors. Customers should be encouraged to call an 800 telephone number if discrepancies exist.
. Charge interest on delinquent accounts receivable.
. Employ personal collection efforts.
. Offer discounts for early payment.
. Have postdated checks from customers.
. Make repeated collection calls and visits. You are considering whether to start a lockbox arrangement that will cost $150,000 annually. The daily average collections are $700,000. The system will reduce mailing and processing time by two days. The rate of return is 14 percent. You currently have a lockbox arrangement with Bank X in which it handles $5 million a day in return for an $800,000 compensating balance. You are considering canceling this arrangement and further dividing your western region by entering into contracts with two other banks. Bank Y will handle $3 million a day in collections with a compensating balance of $700,000, and Bank Z will handle $2 million a day with a compensating balance of $600,000. Collections will be half a day faster than at present. The rate of return is 12 percent. Further worth reading about cash flow management: How Can Cash Payments Be Delayed To Earn A Greater Return? Related Topics:Acceleration Of Cash InflowCash Management SystemExample Of Float MeasurementFloat Time Of A CheckHow Can Cash Be Received SoonerLockbox ArrangementWhat Does The Amount Of Float Depend On? How Can Cash Payments Be Delayed To Earn A Greater Return?